This post is entirely inspired by the wedding of my friend and her new husband, which I attended in Arkansas last weekend with my best friend. This one is dedicated to you, Alisha. Oh, my heart. Everything about this scene…even the little things, like how concerned, then proud, everyone looks as Homer (Harold Russell) puts the ring on Wilma’s (Cathy O’Donnell) finger and how Peggy’s (Teresa Wright) hat falls off when she and Fred (Dana Andrews) kiss. This is one of my favorite scenes of all time. When it comes to Pride and Prejudice film adaptations, I’ve seen (and love) the two most well-known ones: the 1995 and 2005 versions. 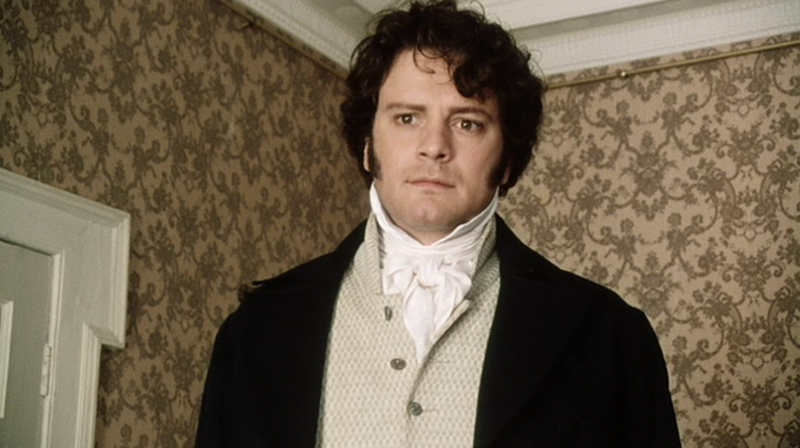 Overall, the ’95 adaptation is my favorite and a big part of that has to do with the fact that Colin Firth is Mr. Darcy (sigh). “Smithy, do I always have to take the initiative? You’re supposed to kiss me.” For fans of tearjerker romances, this film is for you. It’s very sweet. Awkward Professor Potts (Gary Cooper), a master of the English language and researcher of modern slang, falls in love with nightclub performer Sugarpuss O’Shea (Barbara Stanwyck) under false pretenses. When she surprises herself by falling in love with him, she has to figure out what to do and how to get away from her secret mobster boyfriend. The musical score, arranged and conducted by John Williams, makes Motel and Tzeitel’s wedding ceremony beyond gorgeous. And who could forget the bottle dance scene? Okay, I’m reaching with this one because there’s actually not an onscreen proposal or wedding ceremony between Peter (Clark Gable) and Ellie (Claudette Colbert), but this pretty much counts as a proposal, wedding, and much more because Gable slays this scene and it’s super romantic in its own way when viewed in context. The More the Merrier is a pretty underrated film that I highly recommend to anyone who enjoys a fast-paced rom-com featuring two leads with incredible chemistry and an old nosy matchmaking roommate. Joe (Joel McCrea) and Connie’s (Jean Arthur) relationship is hostile from the get-go, which makes it all the better when their tension moves from hostile to romantic. Shout-out to one of the steamiest kissing scenes in all of classic film, too. Oh, Gordon MacRae…one of my childhood crushes. If you’ve read my post about MacRae (published several years ago), you may – or may not – remember that this scene always turns me to mush. It’s tough for me to make a film list without including something from Meet Me in St. Louis. Warren Sheffield’s unconventional proposal to Rose always makes me laugh. The Philadelphia Story is one of the classiest romantic comedies ever made, yet it’s incredibly silly. It’s charming and all over the place and, well, who’s going to end up with who? Nothing says romantic like a good old-fashioned mass shotgun wedding! Seven Brides for Seven Brothers is kind of like Beauty and the Beast in that its plot revolves around Stockholm Syndrome, but this movie is a silly romp full of romantic tension, colorful costumes, understandably concerned fathers, and great song-and-dance numbers. I’m a sucker for period romance films (especially Jane Austen adaptations) and Sense and Sensibility (the 1995 Ang Lee adaptation) has become my favorite. 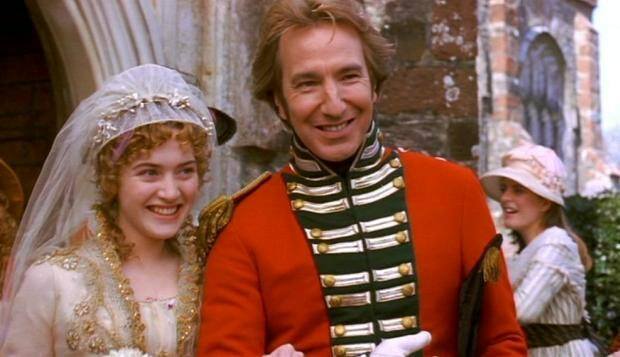 I adore Mr. Darcy, but Alan Rickman’s portrayal of Col. Brandon makes me fall in love with him every time I watch it. Based on Nicholas Sparks’s novel of the same name, A Walk to Remember‘s proposal scene comes during the most emotionally-charged point of the film. Love, love, love. Because what’s cooler than conducting a wedding ceremony via tap dance routine? I’ve usually got to be in a certain mood to feel like watching a melodrama, but I could watch a Douglas Sirk film just about anytime. All That Heaven Allows explores a serious romance between an upper-class widow (Jane Wyman) and her younger gardener, which is threatened by narrow-minded people and classism. Two words: Christopher Plummer. Any further explanation needed? So many great ones here. My favourite proposal scene in a film is the one in Emma(1996). My favourite film wedding is the Captain and Maria’s in The Sound Of Music(her wedding dress is so beautiful too). This is a wonderful post! You chose some great film clips. Congratulations to Alisha and her new husband!